Student handout with requirements & directions for a research project Powerpoint (or Keynote presentation). 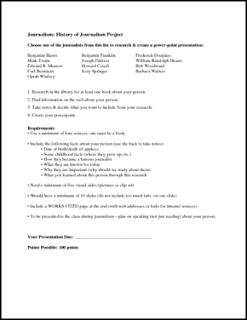 Gives a list of suggested journalists/notable figures in journalism & students must choose one to research. Student worksheet with specific information to find is included. Customize to fit your needs.